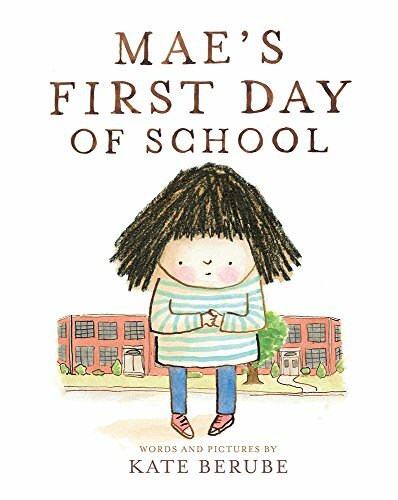 Mae's First Day of School by Kate Berube joins a long line of picture books about first day jitters. Annabelle Swift, Kindergartner by Amy Schwartz, from the child's point of view, is sadly out of print, Miss Bindergarten Gets Ready for Kindergarten, written by Joseph Slate and illustrated by Ashley Wolff, from the teacher's point of view, is only available in paperback. Lola Goes to School by Marcia Goldman is from a dog's point of view, worrying about starting doggy day care, a good first day of school story, but there's still room for human competition. So Kate Berube has found a good place for Mae's story. Predictably, Mae is worried about what school will be like. Will she make friends? Will she miss her mom? She has decided she won't go and climbs up a tree by the school rather than go inside the door. Another child, Rosie, joins Mae up the tree, equally adamant that she won't go to school. As they share all the reasons they won't go, a third person joins them in the tree, also insistent that she won't go to school. Only this person is the kindergarten teacher herself. “Hello! '” said the tall lady. Here is where the story turns as the two girls realize that even grown-ups can be afraid of new things and all three of them decide to try school together. Somehow with friends, new things aren't so scary. The story is sweet, gentle, and yes, predictable, but reassuring all the same. The only discordant note is the page with the teacher sitting in the tree. Her face looks so angry and frowning that it's almost scary. Looking back at the girls' faces, Rosie face looks scared when she talks about school, not angry. Mae looks both scared and angry, but somehow her mad face isn't scary the way the tall lady's is. A child being angry, after all, isn't threatening the way a mad adult is. In a story that means to be reassuring about that big, scary thing, the first day of school, an actual scary thing doesn't fit. I wish the author-illustrator had given the teacher a worried face, a slightly scared one, but not the one she has, which looks almost mean. Still, for kids worried about the first day of school, this book offers something to make them feel better.